Dr. Helen Caldicott at the San Francisco Public Library - Helen Caldicott, M.D. 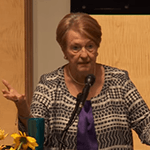 Nobel Peace Prize Nominee Dr. Helen Caldicott, known as the world’s foremost anti-nuclear activist, speaks about whether nuclear disarmament is achievable. Dr. Caldicott is author of The New Nuclear Danger, Nuclear Power is Not the Answer, and Crisis Without End, among others. She has devoted the last forty-five years to an international campaign to educate the public about the medical hazards of the nuclear age and the necessary changes in human behavior to stop environmental destruction. Co-sponsors: Coalition for Nuclear Disarmament, which includes the War and Law League (WALL); Ecumenical Peace Institute/CALC; Berkeley Fellowship of Unitarian Universalists, Peace & Justice; American Friends Service Committee; Shomer Shalom Network for Jewish Nonviolence; Western States Legal Foundation; East Bay Peace Action; Veterans for Peace, Chapter 69; Mt. Diablo Peace & Justice; Code Pink; World Beyond War; Tri-Valley CAREs; Physicians for Social Responsibility, SF Bay Area Chapter; Women’s International League for Peace and Freedom (WILPF), East Bay and SF Chapters.